We’d love your help. Let us know what’s wrong with this preview of Treacherous Passage by Bill Mills. While the Great War raged across the trench-lined battlefields of Europe, a hidden conflict took place in the distant hinterlands of the turbulent Mexican Republic. German officials and secret-service operatives plotted to bring war to the United States through an array of schemes and strategies, from training a German-Mexican army for a cross-border invasion to dispatchin While the Great War raged across the trench-lined battlefields of Europe, a hidden conflict took place in the distant hinterlands of the turbulent Mexican Republic. German officials and secret-service operatives plotted to bring war to the United States through an array of schemes and strategies, from training a German-Mexican army for a cross-border invasion to dispatching saboteurs to disrupt American industry and planning for submarine bases on the western coast of Mexico. Bill Mills tells the true story of the most audacious of these operations: the German plot to launch clandestine sea raiders from the Mexican port of Mazatlán to disrupt Allied merchant shipping in the Pacific. The scheme led to a desperate struggle between German and American secret agents in Mexico. German consul Fritz Unger, the director of a powerful trading house, plotted to obtain a salvaged Mexican gunboat to supply U-boats operating off Mexico and to seize a hapless tramp schooner to help hunt Allied merchantmen. To ask other readers questions about Treacherous Passage, please sign up. As part of the one hundredth anniversary of World War One I have been reading about the war. 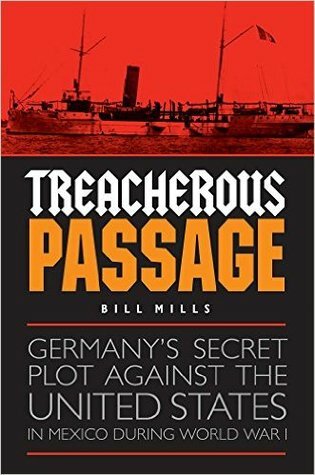 I came across this book “Treacherous Passage: Germany’s Secret Plot Against the United States in Mexico During World War One” by Bill Mills and thought it sounded interesting. This book has to do with the famous Zimmerman Telegram, in which Germany offered to help Mexico regain territory lost to the United States. This, of course, was not the only German plotted activity in Mexico during that period. Mex As part of the one hundredth anniversary of World War One I have been reading about the war. I came across this book “Treacherous Passage: Germany’s Secret Plot Against the United States in Mexico During World War One” by Bill Mills and thought it sounded interesting. This book has to do with the famous Zimmerman Telegram, in which Germany offered to help Mexico regain territory lost to the United States. This, of course, was not the only German plotted activity in Mexico during that period. Mexico in 1917 was a nation riddled with spies, conspirators, corrupt officials and soldiers of fortune. The Germans sought to organize a secret Mexican army to invade the United States. The book is well written and researched. The author writes engagingly about a host of interesting people and little-known World War One events. Mills also tells of the half-baked scheme to raise the sunken Mexican gunboat Morelos from the bottom of Mazatlán Harbor and use her as a commercial raider. Mills tells the stories of many of the colorful characters of the time such as Cornelius Heintz, a German-American, who went to Mexico to dodge the draft and became a double agent; Fredrick Unger, a German business man, who plotted against the United States.